Which colleges would give importance to diversity profiles? Just want to know which colleges would give more importance to diverse backgrounds rather than merit based profiles. If so, do they provide full scholarship for higher GMAT score? Since you are asking an admissions-based question, you may find it helpful to reach out to one of the many admissions consultants here on GMAT Club. 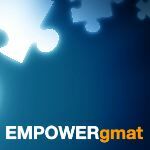 Have you already taken the GMAT? If so, what was your score? If you have not taken the GMAT, do you need advice regarding your study plan? Thanks for the reply Scott, I haven't attempted GMAT yet. Yes it would be great if you can advice a study plan. Since you are just starting out with the GMAT, you should first familiarize yourself with the GMAT and then take an official GMAT practice exam. Your experience taking that test will give you a good idea of what to expect on the GMAT, and the results will serve as a baseline GMAT score. Once you see how far you are from your score goal, you can more easily predict how much time you may need to study. I also wrote a detailed article about how long to study for the GMAT, which you may find helpful. After completing your initial practice test, you will need to devise a solid preparation plan. Since you’re starting from scratch, you should follow a study plan that allows you to learn linearly, such that you can slowly build mastery of one GMAT topic prior to moving on to the next. Within each topic, begin with the foundations and progress toward more advanced concepts. Following such a plan will allow you to methodically build your GMAT quant and verbal skills and ensure that no stone is left unturned. As for the third aspect of getting Sentence Correction questions correct, what you do, the main thing you have to do is be very careful. You have to make sure that you are truly considering the structures of sentences and the meanings conveyed rather than allowing yourself to be tricked into choosing trap answers that sound right but don't convey meanings that make sense. You also have to make sure that you put some real energy into finding the correct answers. Finding the correct answer may take bouncing from choice to choice repeatedly until you start to see the differences between the choices that make all choices wrong except for one. Often, when you first look at the choices, only one or two seem obviously incorrect. Getting the right answers takes a certain work ethic. You have to take the time to see the differences and to figure out the precise reasons that one choice is correct.